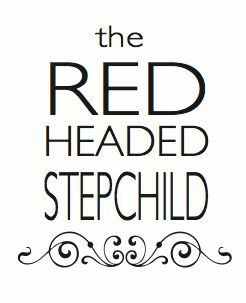 The Redheaded Stepchild: DIY update: crib skirt, now with velcro! 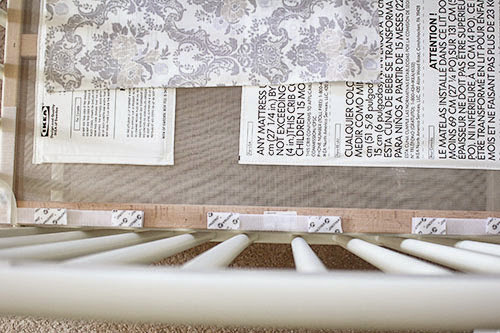 DIY update: crib skirt, now with velcro! Every week, I get an email newsletter about Baby P’s projected progress in developing from an undifferentiated clump of cells into a whole real person. And this week’s newsletter reassured us: Baby P is far enough along that if he chose to make an early appearance, he would probably be just fine! So on one hand, high five for making it this far, kid! On the other... I guess that means there’s a chance he could be here any day... or at the very least, SOON. Very soon. Whoa. I guess maybe he needs a place to sleep? Technically, the baby will sleep in our room for the first few weeks, at minimum. But there’s nothing stopping us from sleeping in his room – there’s a bed in there after all! Except... he had a crib, but no mattress. Until recently! If you’re wondering how we selected a mattress, it went something like this: read Consumer Reports to figure out what’s important, read Amazon reviews to figure out which mattress accomplishes those things without spending a million dollars, and finally, check Target to see which of my short list are available in-store. The end. I probably spent thirty minutes on it, because I gots stuff to do, y’all. Despite (or because of?) my minimalist research, we’re happy so far! This mattress fits perfectly in our IKEA crib (no gaps!) and even helpfully informed dumb first-time parents which side is up. But! Before I could finish making up Baby P’s bed, I decided to revisit something I kinda half-assed the first time: attaching the DIY crib skirt. I was so sure that I’d be able to attach it with thumbtacks, but turns out the wood IKEA uses for their cribs is pretty dang solid. I had just stuck the tacks in the mesh instead, but realized I’d probably be kicking myself the first time I had to change the sheets and ripped off the crib skirt. 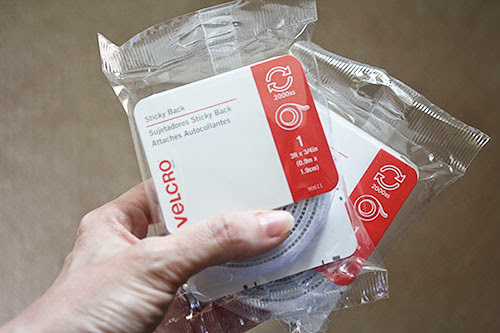 So, I took the suggestion from Janice in the comments and bought a few packs of adhesive-backed Velcro. I decided to attach all of the “scratchy” sided strips to the crib frame itself. I simply cut it into smaller bits and attached it around the crib, paying special attention to where the edges of the panels would be (so no saggy corners). Then I cut up half the “soft” side to attach to the fabric. Why half? Because this is adjustable, remember – I’m going to want to use the other half when we lower it. Rather than attach the “soft” sided pieces to the fabric, I left them stuck on the Velcro, as illustrated below. Then I simply positioned the panel into place and smushed it down onto the adhesive backing. No guesswork! 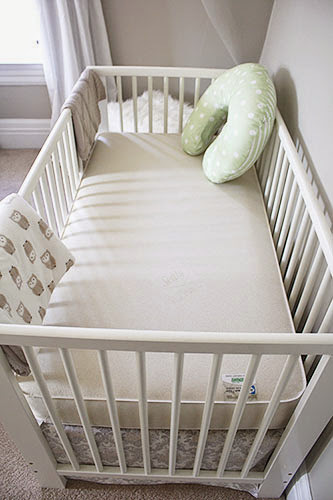 I suppose it’s possible that you could attach both “scratchy” and “soft” sided strips to the crib, and just alternate which complementary side you add to the skirt. But honestly, figuring out the way to do that was making my head hurt, and I couldn’t be sure I’d do it correctly for the next height, so I went the easy way out. And it worked, so that’s all that matters! Also, even though the adhesive wasn’t recommended for use on fabric, I found it adhered quite well. 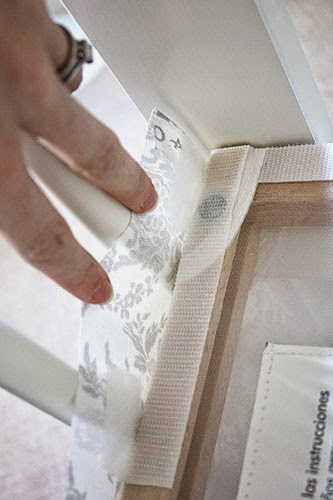 I might not ask Mr. P to remove the crib skirt – sometimes the man doesn’t know his own strength – but when I did a quick test, I was able to separate the Velcro without ripping the fabric off the adhesive. Hooray! The after isn’t that impressive, because the crib skirt itself looks mostly the same. But it’s much better in the context of a mattress and sheets, and anyway, now we all know that how it’s safer and secure, even if you can’t see it! Total cost to finish this project? About $8 and another half hour of my time (that’s less than an episode of Serial). 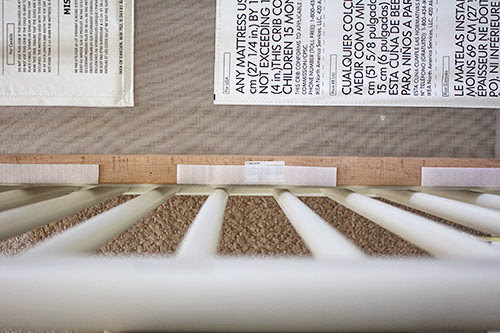 And if you add that cost to my previous project summary, this crib skirt still only cost $22 – a full hundred bucks less than my Restoration Hardware crush! So THANKS to Janice and her comment, no more half-assed-attached crib skirt! See, I do love your comments, you dear readers. 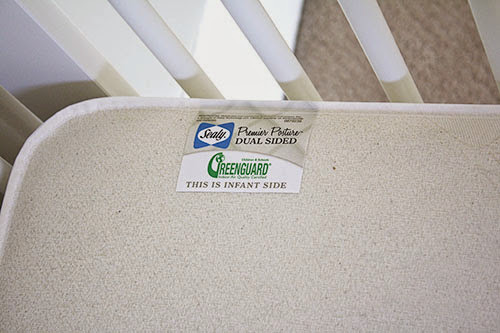 And I’m glad that the greatest danger in our crib is now that the kid will get scratched by Velcro, not that he’ll swallow stray thumbtacks his parents leave in his bed after changing pee-soaked sheets in the middle of the night. Do I get some sort of “less likely to puncture their child’s intestines” parenting award now?! Probably no award for you. But you can be assured your own mother can worry about one less thing now... This better solution may have in the end saved two lives! Plus some foot finding one, too, in the form of a stray unaccounted-for tack buried in the carpet plush left there unbeknownst or by a too-sleepy-to-look-now-I'll-find-it-tomorrow-type-parent.Yay! Parents do so many, many things that largely go tangibly unrewarded anyway, though - so get use to the feeling, kiddo. ;-) <3 U! 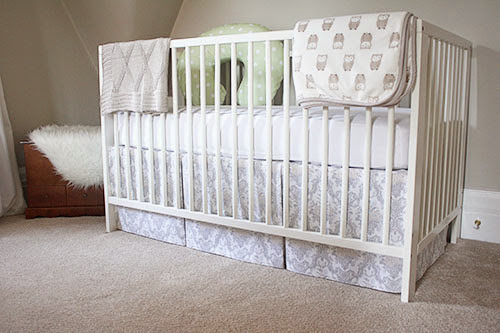 LOVE the crib bedding set-up! Very pretty. Glad the velcro came to the rescue. I've used it for hanging valances as well. Makes for quick seasonal changes to the windows ;) oh the possibilities are endless. you make me laugh and i love it! Yay...much better :) A good rule of thumb is to just assume that anything a little person can do or get into-they probably will...so prepare for what you can, the others will be so totally "how in the heck did they manage to do that?"